We look at two settings with asymmetric information; one side of a game knows something that the other side does not. We should always interpret attempts to communicate or signal such information taking into account the incentives of the person doing the signaling. In the first setting, information is verifiable. Here, the failure explicitly to reveal information can be informative, and hence verifiable information tends to come out even when you don’t want it to. We consider examples of such information unraveling. Then we move to unverifiable information. Here, it is hard to convey such information even if you want to. Nevertheless, differentially costly signals can sometimes provide incentives for agents with different information to distinguish themselves. In particular, we consider how the education system can allow future workers to signal their abilities. We discuss some implications of this rather pessimistic view of education. Professor Ben Polak: So today we’re going to study asymmetric information. It’s our last week, and we’re going to focus on signaling today. I’ll spell it with one “L” here as a concession to the Americans. So we’re going to divide this class into two parts. And for the first part we’re going to focus on the case where there is some verifiable information in the problem. So we’ll see what this means in a while, but let me just set up an example and we’ll see where that takes us. So I want to return to a game we know well by this stage, which is the Cournot game. So there’s two firms, and they’re competing in Cournot–so they’re competing in quantities–and we’ll call the firms A and B. Suppose that Firm B has costs–so to be more formal, these are constant marginal costs–equal to cM, where M means middle or medium or something. Firm A also has costs but those costs could come in one of three types. It could be that Firm A has high costs, and high costs are equal to middle costs, plus a little bit. It could be that Firm A also has medium costs. And it could be that Firm A has low costs, and the low costs are just the medium costs minus a little bit. Now, before this competition’s going to take place, before they’re actually going to play the Cournot game, Firm A has an opportunity. Firm A’s opportunity is to reveal its costs to Firm B. So to make this more explicit, initially, Firm B obviously knows his own costs and, since there is only one type, Firm A obviously knows those costs as well. So Firm A and Firm B know what Firm B’s costs are. But initially, although Firm A knows her own costs, Firm B does not know Firm A’s costs. So let’s write that up. So Firm B knows only its costs, and Firm A knows both costs. But the key decision we’re going to focus on is that Firm A has an opportunity to reveal its true costs to Firm B. Now, it can do so in a verifiable way. For example, it could hire an accountant. That accountant from a reputable outside firm could come in and do the accounts for Firm A and then publish them in The Wall Street Journal or something. So Firm A can do that, and let’s assume it’s costless for it to do that. So Firm A can costlessly and verifiably reveal its costs to B. The question is: this is going to happen before they play Cournot. The question is: should Firm A reveal those costs or not? Should Firm A publicize or give away its informational advantage, if you like, to Firm B by telling Firm B what its costs look like. So what do people think? Let me grab the mike and ask people a little bit. Imagine you’re the manager of Firm A. Are you going to tell Firm B what you’re costs are or not? Wave a hand in the air, or should I just cold call here? Let me cold call, so what’s your name sir? Professor Ben Polak: Hugh, and so suppose you’re the manager of Firm A, would you reveal the information or not? Student: I would tell them only if my costs were lower. Professor Ben Polak: All right, so Hugh says I would reveal the information only if my costs were lower. Now why do you want to reveal the costs if you have lower costs? Student: Because then my firm will produce at a lower cost so Firm B will produce less because they know that we’ll get most of the market. Professor Ben Polak: Good. It’s Hugh, is that right? Professor Ben Polak: So the point that Hugh is making is there may be some advantage in having the other side know my costs if my costs are low, since that may induce the other side to produce less. Let’s just fill out that argument by putting in the Cournot diagram. So here’s the Cournot diagram. Here’s the quantity for Firm A. Here’s the quantity for Firm B. And here is the best response or reaction curve for Firm B. And in this picture there’s going to be three different possible reaction curves for Firm A, each one corresponding to different costs. So, for example, this could be the reaction curve or the best response for Firm A in the case in which it’s medium. But if it had lower costs what would happen to that reaction curve? Would it shift in, would it tilt, what would happen to it? Someone shout it out. It would shift out. If it had lower costs then it would shift out so this would be the best response for Firm A in the low case, and conversely, this would be the best response for Firm A in the high case. So the point that Hugh is making–or he should correct me if this is unfairly paraphrasing him–is if I have low costs then I want the other side to know I have low costs because that puts us into the equilibrium in which this is my best response curve and this is the other side’s best response curve, and Firm B ends up producing less and ends up lowering its production. Is that right? So the key idea here is that this is a game–an idea we’ve had often–this is a game of strategic substitutes. So if I have low costs, I want the other side to know that I have low costs because it will cut back its production which helps me. On the other hand, if I have high costs, then I kind of like to remain hidden. I really don’t want the other side to know that I have high costs, because if I have high costs, the other firm’s actually going to increase their production and that’s going to hurt me. But notice I’ve twisted the question a little bit. The question I actually asked you was: would you reveal the information about your costs. And I flipped that around to a slightly easier question which is: what would I like the other side to know? Now what would I like the other side to know? I’d like the other side to know if I have low costs. I’d like the other side not to know if I have high costs, but that’s not quite the question we asked. The question we asked was would you, given whatever your costs are, reveal that information to the other side? I think what Hugh has told us is–so to say exactly what he said–Hugh said if I had low costs I’m going to reveal it to the other side. Is that right? So, so far what do we know? So far we know that if I have low costs then I will reveal it. So far we know that. But what if I don’t have low costs? What if I have middling costs or high costs? Well let’s take these in turn, what about middling costs? What should I do if I have middle level costs? So somebody’s got their hand up, let me go and take advantage of that. What’s your name? Student: I think you should still reveal because they know if you had low costs you would reveal, and so if you had middle costs and you didn’t reveal then they could think you either had middle costs or high costs and it’s better for you to just reveal that you had middle costs. Professor Ben Polak: Good, did people hear that? Let me just repeat that. So you might think that if I have middle costs, you might think that I could reveal or not reveal, depending on what the other side thought. However, what Alec’s arguing correctly, is if I don’t reveal that I have middle costs, the other side, Firm B, knows that my costs are not low. So the only way they could mistake me is they could think I’m a high cost firm. They know I’m not a low cost firm. How do they know I’m not a low cost firm? Because the low cost firm would have revealed, that was Hugh’s argument. So since low costs are firms are revealing, if I’m the middle cost firm, if I don’t reveal no one’s in any doubt I’m not a low cost firm. So all I could be is a middle cost firm or a high cost firm. All I could have is this reaction curve, which is the one I actually have, or this reaction curve. So if I don’t reveal then the other side might think that I have high costs in which case they’re actually going to increase their production and hurt me. So since the low cost firm is going to reveal, the medium cost wants to reveal to ensure that no one thinks it’s high costs. So low cost reveals and therefore cM reveals as well to prevent being mistaken for a high cost firm. Now there was a question, let me come down and collect the question. Yeah? Student: I was just going to ask what if you have, A reveals to both to the low and middle class, then they’re obviously going to know that he’s a high cost, which means that the concealing doesn’t do any good. Professor Ben Polak: Exactly, and your name is? 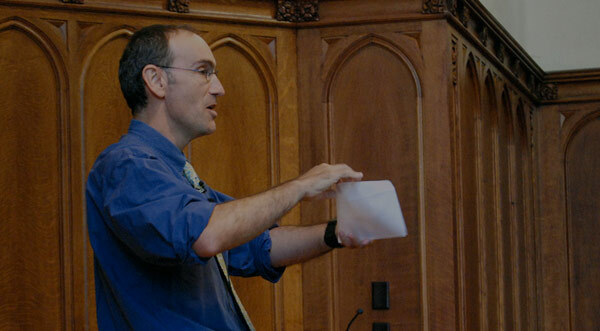 Professor Ben Polak: So Bethany’s pointing out that once we know the low cost type’s going to reveal, we know that the middle cost type is also going to reveal so as not to get mistaken for being high cost, which means, if you’re running a high cost firm, it really doesn’t matter whether you reveal or not, because you’re going to be revealed by the fact that you didn’t reveal. Is that right? Had you been low cost you would have revealed. Had you been middle cost you would have revealed. And therefore, whether you choose to reveal or not, everyone knows that you’re high cost. So therefore, cH is revealed. Everyone see that? Okay, now notice that in this argument we’ve just constructed there were three types of firms - high, middle, low. But I could have constructed exactly the same argument, albeit somewhat more tediously, with a 100 types of firms. Firms that had absolutely the lowest costs, firms that had the 99th highest costs, 98th highest costs, 97th highest costs and so on. And this argument would have been exactly the same. At each stage the firm that’s left in the analysis who has the lowest cost, will want to reveal to distinguish itself from those who haven’t revealed “yet,” and therefore we’ll get unraveling. We’ll get information to be revealed, and notice interestingly, we’ll get information to be revealed beyond the medium. So the 51st highest cost firm will reveal, therefore the 50th highest cost firm will reveal, therefore the 49th and so on. In fact, the only firm who won’t explicitly, actively reveal themselves is the firm who has absolutely the highest cost. And as Bethany points out, they’re going to be revealed anyway. So this is an idea–this idea is called “informational unraveling.” And again, in keeping for my American audience, I’m going to put one “l” in unraveling. Is that right, there’s one “l” in America right? Someone should just check that on Google or something, I think that’s correct. What’s the lesson here? So one lesson is that this happens. We’ll come back to that, but another lesson, perhaps a more important lesson is: often the lack of information, the lack of somebody signaling to you, the lack of somebody trying to tell you something, conveys information. This was the point that Bethany was making. The fact that the high cost firm doesn’t in fact go out and reveal information to you, reveals something about what it knows. So Hugh’s initial comment was correct. If I was the high cost firm I’d like to remain hidden but I can’t remain hidden. From your point of the view as the receiver of the information, there is information in the lack of the attempt to convey information. So lesson: the lack of a signal, the lack of an attempt of a firm to signal you some information, the lack of a signal can be informative. So this is an often forgotten lesson. It’s a very simple idea, but there’s a natural tendency when you’re dealing with information to focus on the evidence that is there, rather than the evidence that’s not there. There’s an expression that goes with this. The expression is “silence speaks volumes.” You’ve all heard that expression, silence speaks volumes. Let me give you one other example. So there’s a Sherlock Holmes story–by the way, do you all know who Sherlock Holmes is? Good, so there’s a Sherlock Holmes story in which Sherlock Holmes solves the murder. He figures out who did the murder. And Dr. Watson who’s his sidekick is trying to figure out how Holmes could possibly have solved the murder. He says how did you solve the murder? Holmes says, it’s because of the barking dog. And Watson says, what do you mean it’s because of the barking dog? The dog didn’t bark. Holmes says, that’s exactly the point, the fact that the dog didn’t bark, didn’t make any sound tells us who must have committed the murder. It’s very easy to fall into the trap of being Watson and to ignore the thing that didn’t happen and focus on the things that did happen. Here, it’s easy to forget that actually the high cost firm is revealed by doing nothing. So this is the idea that silence can speak volumes. Every year I go back and try and figure out what that quotation is from and I can never find it, so anybody who finds it I will give them a prize of some sort. Originally I thought it must be Shakespeare but it doesn’t appear to be. So this is a little example involving Cournot, but I want to try and convince you that this example is more general. Let’s pick up the question; sorry go ahead. Student: Isn’t it possible that there’s an equilibrium where the costs of remaining hidden as a middle cost firm outweighs the benefit. Professor Ben Polak: Not if we take the model literally. Not if we take the model in Cournot literally because, suppose Firm B doesn’t know whether you’re high or middle, then he’s going to think your costs are somewhere in between and relative to your costs being middle he’s going to produce more, that’s the point here. Now it’s true that in a richer model there may be some other advantage in having information hidden, but that would have already applied to the low cost firm. Let me give you some other examples and we’ll see this in other contexts, and see that it might actually ring true. So one other example involves resumes. So this example requires some explanation for the non-Americans. How many of you are non-Americans here? So one thing you need to know as non-Americans is the way in which people write resumes in America. Everyone know what a resume is? A CV, a resume, right? So when you look at a typical resume from an American student–if you’re not American, for those of you who aren’t American–how should I put this politely? It has a tendency to make you want to vomit. So that’s basically the polite version of what I was going to say about that. So why does it have a tendency to make you want to vomit? Because Americans have a tendency to put down everything on their resume. So if they were captain of the chess team in third grade, and there they are now, they’re forty and applying for a job, it still says I was captain of the chess team in third grade. And this is particularly true when it comes to public service, when it comes to sort of moral acts. So most people in Europe will be a bit embarrassed about writing their good deeds on their resumes, but Americans, there’s a little spot on their resume which is about their good deeds or their public service and they put everything. When I was eight I helped a little old lady across the road with her shopping basket, and there it is on their resume. So why is it that Americans reveal so much information on their resume? Well think about informational unraveling, right? So resumes are verifiable information, it’s hugely costly to be caught cheating about your resume. So basically you’re not going to lie on your resume. And imagine if I’m admitting students, let’s say to law school, to Yale Law School, and I’m reading the student’s resume and in the spot where I’m expecting to see public service there’s nothing written there. What do I assume about that student? I assume that the person did nothing. This person has been a self serving “evil git” their entire life, has never even helped a little old lady across the road. So people put down everything, even these minimal things, even these pretty shockingly tiny acts of charity to reveal themselves from those people who did absolutely nothing, that are basically the devil incarnate. So this is about resumes, let’s just take this a bit further. How many of you are from Los Angeles? So in Los Angeles I’m led to believe, I’m told–you can confirm this or not–there are lots and lots of restaurants. This is true, right? Lots of restaurants and some of these restaurants are good and some of them are bad. And, more to the point for today’s example, some of these restaurants are clean and some of them are not so clean. Is this true? So it turns out that until the late nineties, the Los Angeles Municipality rules, local law, said that every restaurant in Los Angeles County, I think it was, had to get visited by the health inspector. And the health inspector would come around, I think it was annually, and go to these restaurants and they would issue a certificate, and this was a health certificate and written on it large letters–I think they were red letters–was either A, or B, or C. There may even have been A- as well, but for the purpose of the story let’s just call it A, B, and C.
Now that was all the law said. The law did not say that you had to display your health certificate anywhere. So what does this model tell us to expect about Los Angeles in the mid-nineties? Well if you’re running a little restaurant in Los Angeles and you get an A health certificate from the health inspector, what are going to do with that A certificate? You’re going to display it prominently in the window, right? A health certificate. So if you’re running a slightly less healthy restaurant, maybe this is Ale’s pizza chain again, and you still get a B certificate from the Los Angeles Health Inspector, are you going to display it or not? You’re going to display it right, because why not? We know the A’s are going to display. These certificates are being given to everybody, so you’re going to display even a B certificate. Now, I’m told, from people who lived in Los Angeles at the time, that you could go around to the greasiest spoon in Los Angeles and look through these grease smeared windows with the cockroaches running all up and down them, and if you looked carefully behind the cockroaches and the grease you’d see a certificate displayed that said C on it. Presumably there was a D grade as well: even the C’s were displaying. So that’s pretty dramatic information unraveling. Now, I’m exaggerating slightly to make a separate point. It turns out that in certain areas of Los Angeles you’d expect to see these health certificates displayed, even the C’s, and in other areas you wouldn’t expect to the see the C’s displayed. Which areas would you expect not to see people bothering displaying their C or B- certificate? Any guesses? The tourist areas. Because for this story about information unraveling to work, the people who are the receivers of the information need to know that you got the certificates. So if you’re a tourist in Los Angeles, you don’t know this system is in place, and therefore if you’re a C certificate right next to Disneyland or something, whatever it is, you can still make some tourists ill, without having to tell them you’re about to do so. So that’s a second example, let me give a third example, a little bit closer to home. At the last curriculum reform at Yale, there was a big debate about what to do with Credit D/Fail. And one of the proposals for Credit D/Fail was to allow students to take courses Credit D/Fail, but if they ended up getting an A or a B, they could display the A or the B on their resume. So they take a Credit D/Fail, but if they got a grade like an A or B, or an A- or whatever, then they could opt in and have it put on their resume. What’s wrong with that? This is a serious proposal. I was on this committee. This was seriously made. I didn’t make the proposal but this was made. What’s wrong with this proposal? What’s wrong with the proposal? What would displaying Credit on your transcript come to mean? It could come to mean C right, it would come to mean C, because all of the A’s and the B’s would unravel that information. So if information is verifiable and can be freely transmitted, it has a way of coming out. Let me give you one slightly more serious example. As you all know, if you’re arrested in the U.S.–you should know this–you have the right to remain silent. I’m not saying you’re all about to get arrested, but were you to be arrested, you have the right to remain silent. That right was true in Britain as well until recently, when the government, which isn’t so big on civil liberties, changed the rule slightly. So now you have the right to remain silent in Britain, but the Court has the right to take into account as evidence if you remain silent. So what’s that done to the right to remain silent. I’ll leave it to you to figure out what that’s done to the right to remain silent. So this idea that information unravels depended on certain key parts and the most important part was that the information was verifiable. It mattered that the information was verifiable. And to get full unraveling all the way down, in this case to the highest cost firm, you needed the people on the receiving side of the information to actually know that that information was there. So to get the full unraveling you really need something like common knowledge of the presence of the information. But often, the information that you have–you have information, you want to reveal that information–but unfortunately it’s not so easily verifiable. So what we’re going to focus on for the rest of today is information that is not verifiable. Let’s start with an example that’s pretty close to home. A lot of you have been doing job interviews recently. How many of you have been going out either doing interviews for internships or jobs? I know a lot of you are missing class so I’m assuming charitably that’s what you were doing. So when you go to these job interviews you could imagine that you’re turning up for some job interview, let’s say it’s at Boring Bank of Boston. And you turn up at this interview for Boring Bank of Boston, and one of the things that Boring Bank of Boston wants to know is are you interested in working for Boring Bank of Boston. That’s a plus for them. What they tend to do is they ask you. More or less they say, are you interested in working for Boring Bank? Now by the way, if you are asked the question, and you’re interviewing for Boring Bank, and you’re asked the question by them are you interested in working for Boring Bank, what answer should you give? You should answer yes. How much information is there in the fact that you answer yes? None at all, right, because clearly you want the option of working for this bank, so you’re going to answer yes anyway. Now you may think this is just a fictional example, it’s not. I talked to some recruiters from a bank in Boston that we’ll refer to as Boring Bank of Boston not so long ago, and I asked them about hiring Yale undergraduates and what Yale undergraduates should do to impress them. And the recruiter, who is a Yale graduate himself, said to me that frankly Yale undergraduates do less well in these interviews than Harvard undergraduates. I said, shattered and disappointed–I said why, and he said, well when we asked them if they’re interested in working for Boring Bank of Boston the Yale guys say things like, well I don’t know it sounds kind of boring. The Harvard guys, what do they do? They show up with The Wall Street Journal folded over conveniently on the page about Boring Bank of Boston, and sometimes they’re wearing a silly hat with I’m boring on it. So I tried to persuade this guy that despite this fact, there’s really no information in the fact that the Harvard guys are doing this, and in fact you should hire the Yale people because at least they were honest, and, hey, that might make the bank less boring in the future. This didn’t work, so I need to persuade you guys to actually cough up and be dishonest here. There’s a lesson here. So one lesson is, if you’re asked by an interviewer for a summer internship or for a job later, if you want to work for them, the answer is yes. It’s one of the few questions for which the answer is not backward induction: it’s just yes. There’s a secondary lesson here, which is, if an interviewer for a bank is asking you in the interview if you’d like to work for them, you probably will answer yes, but you probably want to work somewhere else. If they’re dumb enough to ask you that question you probably want to work for someone else. But this is a real problem. The problem is here you are. You have some information you’d like to convey. Maybe you really are boring. Maybe you really do want to work for this bank. You want to convey this information, but it’s hard for you to persuade the employer that this it is true because anybody can say they want to work for the bank. More generally in life, this isn’t only about whether you want to work for a particular bank or whatever it happens to be, it’s also about whether you are a good worker or not. So let’s try and think about this in the context of not only workers being boring or not, but workers being good or not. So we’re going to look at a costly signaling model. It’s going to turn out, this model’s going to be about costly signaling, and just for the purpose of the model we’re going to assume that there are two kinds of workers in America. There are good workers, we’ll call them G, and there are bad workers and we’ll call them B.
We’ll assume that the productivity of a good worker, if you work for this firm, is going to be 50 and we can assume this is $50,000 or whatever but let’s just forget units for now and just call it 50. A bad worker, their productivity is only 30. So clearly, all other things being equal, the employer would rather employ a good worker than a bad worker. All other things being equal is important because then we have to pay the good worker more. Let’s assume this is the U.S. economy, so roughly 10% of the economy are good workers and 90% are bad workers, something like that, and these are the proportions in the U.S. Let’s also assume that firms are competitive. So firms are flooding into the Yale Careers Office, or the Yale Careers Fair, and they’re just desperately trying to hire these workers. There’s competitive hiring going on. So firms compete for workers. So they’re going to pay 50 to a worker they identify as good. They pay 50 to a worker, they the firms identify as good. And they’re going to pay 30 to workers they identify as bad. If you’re bothered by this being exact, think of it as 50 minus a penny, and 30 minus a penny. It’s not going to make any difference to the analysis. So if they can’t identify a worker, they think the worker’s just the average worker, how much will the competitive wage be? What will be the competitive wage of the average worker in this economy? It’s not a hard math question. Everyone’s scratching their head down here. So this is 50 x 10% and 30 x 90%, which averages out as? 32% all right. So they’ll pay the average which is 32 to a worker they cannot identify. You could even do this in a costly manner. You could humiliate yourself by jumping up on the table and dancing on one leg while singing some song about how you’re a good worker, which would be humiliating but it wouldn’t in fact communicate to the firm that you’re a good worker. Why is it that you’re dancing this beautiful jig on the table of the interview room, singing this beautiful song about how you’re a good worker, why doesn’t that convince the firm that you’re a good worker? Who’s been in job interviews recently? Has anyone tried this? Why is that not a successful strategy? Steven, is that right? Student: Yes. A bad worker could do that too. Professor Ben Polak: A bad worker could do that too. So it’s true that it’s costly and humiliating to dance up on the table on one leg and sing you’re a good worker, but it’s no more costly and humiliating for you than it is for a bad worker. So if that worked, a bad worker would do it too. So merely a song and dance isn’t going to work. It’s going to be hard to signal to the outside world that you’re a good worker. That’s going to be our starting point. So we need a way for good workers to distinguish themselves from bad workers. We need a way for them to signal, and what’s key about that signal is it has to be a signal that they can make and a bad worker cannot make, or alternatively, a signal that they will want to make but a bad worker will not want to make. So dancing on the table doesn’t do it, and the reason it doesn’t do it is bad workers and good workers are symmetric with respect to the dishonor of dancing on the table. So we need a way for good workers, you guys, to distinguish yourself from bad workers, us guys. How in the American economy, what’s the main way in the American economy in which good workers signal the fact that they’re good, that they manage to distinguish themselves. What’s the main signal used in the U.S. economy? Somebody? Yes, education. So the main signal in the U.S., not the only one by any means, but the main signal is education. What’s going to distinguish the good workers from the bad workers is the good workers are going to have degrees, more degrees, better degrees, more degrees, whatever. So what we’re going to look at today is a model some of you have seen before but we’ll do it in a bit more detail perhaps. It’s a model due to a guy called Spence, Mike Spence, who actually won the Nobel Prize in large part for this model. The reason we know he won the Nobel Prize in large part for this model is he didn’t write practically anything else, so it must have been for this model. So what we’re going to do is we’re going to imagine that the degree, the education that these people are going to get, that’s going to distinguish themselves and show that they’re good workers to the employers–let’s assume that the employers once again are banks or whatever–we’re going to assume that the extra piece of education they’re going to get is an MBA. Some of you out there are getting an MBA. Where’s my MBA? There he is. There’s my MBA student up there. So the good workers are going to get an MBA, and the way this is going to work, it’s going to work on the costs of getting an MBA. So to get to this to be a successful signal, to make this signal different from merely dancing on the table, it’s either got to be the case that bad workers cannot get an MBA or it’s got to be the case that it’s so costly for bad workers to get an MBA that they won’t bother. So we’re going to make the difference in costs. So we’re going to suppose that the cost per year of getting an MBA, of being in business school, MBA education, is 5 units if you’re a good worker. We’re going to assume that the cost per year of going to SOM and getting an MBA is a little bit over 10, so 10 and a penny if you’re a bad worker. So notice I’ve assumed in this model that it’s more costly per year to get an MBA at Yale say, if you’re a bad worker than a good worker. Now, what are those costs? What are the costs of getting an MBA? What’s causing that cost difference? Well let’s be clear what it isn’t. It can’t be the fees. The fees are a large part of the costs. What are the fees of getting an MBA at Yale this year? Way too much right. So the costs per year in terms of fees are enormous, but the fees themselves are not going to do a good job of distinguishing between good and bad workers. Why? Because they’re the same for both parties. We want something which is differently costly, so this is not the fees. It can’t be the fees. They’re the same for both parties. What other costs are there to getting an education? There’s opportunity costs right. All of you are economists–or half of you are economics majors–so the first thing that should spring to mind is opportunity costs. But actually opportunity costs don’t help me here much because if anything you’d think that the opportunity costs of going and getting an MBA at Yale are higher if you’re a good worker than if you’re a bad worker. After all, if you’re a good worker you could stay home, not get an MBA, farm your parent’s garden, and, since you’re such a good worker, you’d have a high yield in carrots or whatever. Whereas, the bad workers will not produce anything, right? So this is not really about opportunity costs, in fact, we’ll assume that they’re zero. We’ll assume there are no opportunity costs. So what is it that’s driving this cost difference between the good worker at SOM and the bad worker at SOM? Was that a potential answer out there? Student: Is it the present value of future wages for a good worker? Professor Ben Polak: Okay, so there we’re thinking about the future. No, let’s just focus on the cost side. You’re right there’s going to be different things going on in the future, but let’s focus on the cost side. I had you before so let’s have this guy. Professor Ben Polak: Mental effort, right. So where’s my MBA student up there. Here he is–where is he, up there. It’s pain and suffering, is that right? I can’t see him yet. He’s nodding, good. It’s having–when you go to the MBA class–of thinking my God, thank goodness I escaped being an undergraduate, and you go back to the MBA class and I’m there again. I’m assigning the same horrible problem sets and you still can’t read my handwriting and you’ve still got to deal with my accent, right? Good workers find it easier to read my handwriting and deal with my accent, right? So what it is? It’s the mental effort. It’s the pain and suffering. It’s the pain of the work. The only thing that distinguishes the costs of good workers from bad workers in education is it’s so painful to do the work. If we went to a party school, this wouldn’t work. That’s why we can’t just have party schools. We actually have to put you through some pain in the classroom. I’m looking for some confirmation from up there. So the pain of the work is what distinguishes these things. Now I claim that we can have an equilibrium in this society in which there are good and bad workers; in which good workers cost per year is less than bad workers cost per year of getting, in this case, an MBA–we could do the same for undergraduate education but let’s focus on the MBA for now. I claim there’s an equilibrium in this society, there could be an equilibrium in which getting an MBA takes three years. So I claim there is an equilibrium here in which what happens? In which there are three year degrees, degrees take three years–a three year MBA sounds a bit frightening but never mind–in which the good workers all get MBA’s and the bad workers do not. But to tell you this is an equilibrium I need to do a little bit more, so let me tell you one other thing. So I claim there’s an equilibrium in which the degrees take three years, all the good workers get MBA’s, all the bad workers do not get MBA’s, and what? The employers identify MBA’s as good workers. To make this work it has to convince the employers. So to make it work I need: and the employers identify MBA equals good, and not-MBA equals bad. So that’s what I claim is an equilibrium here and what I want to do is I want us to show that this actually is an equilibrium. Now then, this is a slightly different kind of equilibrium to anything we’ve seen in the class so far, so I’m going to be a little slow and nerdy about what we need to check to check that this indeed is an equilibrium. So I’m going to leave some space on the board and you should leave some space too. So my claim is this is an equilibrium. And we’re doing guess and check. I did the guess for you and we’ll do the check together. To check, I claim, I need to check two things. One, I need to check that no type will deviate. So what do I mean by a type? I mean types of worker. Neither the good types of workers would want to deviate nor the bad types of worker would want to deviate. So this isn’t new. When we’ve checked equilibrium we’ve always checked that people don’t want to deviate. The only slight difference here is instead of checking that people won’t want to deviate I’m checking that types of people won’t want to deviate, but basically the idea is the same. Is that right? The idea’s the same, so this is not really new. The new thing is I also need to check–actually I’ll give myself a bit more room here–I also need to check that the employer’s beliefs are consistent with the equilibrium behavior. So let’s just stop and pause at that a second. We’ve never written down a condition like this for equilibrium, but here I have to. Here there was asymmetric information in the model. And, in this equilibrium, one important party to the equilibrium, namely the guys who are going to employ you, that’s pretty important right? All they really have to do in this model, of any importance, is form an inference based on your actions. They observe whether you get an education or not and they conclude whether or not you’re a good or bad worker. So we’re going to write down as a condition of this being an equilibrium that those inferences “make sense.” By make sense I mean that they’re consistent with what actually is happening in equilibrium. So before we get too nerdy about that let’s just think why that’s a sensible thing to require. Suppose, in fact, suppose the world was like this. All good workers got MBA’s, all bad workers did not get MBA’s, and employers thought that the people who got MBA’s were half good and half bad. That just doesn’t sound right, right? If in fact it’s the case, that it’s the good workers who are getting MBA’s and the bad workers who are not, then the only belief that the employers can have that’s consistent is the MBA’s are in fact the good workers and the non-MBA’s are the bad workers, is that right? So I’m not making any deep point here, I’m just pointing out that we need to make sure that the beliefs that people hold in this equilibrium are consistent with what’s actually going on in the equilibrium. But having said that, there’s no mystery here, everything’s fine. In this particular claim of an equilibrium, good workers are the ones who got the MBA’s; bad workers are the ones who didn’t get the MBA’s; and the employers, when they see an MBA, indeed think they’re good; and, when they see a non-MBA, they indeed think they’re bad. So these beliefs are in fact consistent with behavior, so we’re okay. Okay, so I’ve had to check that but it wasn’t a big deal. Everyone okay about why I’m checking it? I don’t want people to hold silly beliefs at equilibrium, that’s basically what I’m saying. All right, now let’s go back and check the sort of bread and butter thing. The bread and butter thing is we need to check that no type of worker is going to want to deviate in this equilibrium. So there’s two types of worker. There’s good workers–and good workers, what are they doing in equilibrium? What are the good workers doing in equilibrium? They’re getting an MBA. So the good workers, they become MBA’s, and what are the good workers identified as? Once they got an MBA what does the employer identify them as? Good workers, right? They’re identified as good. They get MBA’s. They’re identified as good, and their payoff is what? What’s the payoff of the good workers here? So they get paid 50 which is their productivity, but it costs them three years of putting up with my homeworks. So it costs them 3 x 5, five for each year. So 50 - 3 x 5 is what? 35, good. So they get a total payoff of 35, and let me just pause a second. I made an assumption here without telling you it, so I’m going to say it. Just to make the math simple we’ll assume that once you get employed you work for a year and then you drop dead. That’s a slightly morbid and unpleasant assumption, but otherwise we have to do kind of present discounted value of your whole future income and then it turns into an accounting class. So we’ll just assume that everybody lives for one year. If you want to do a more complicated model then that’s fine, the idea will be the same. So they get paid 50, it’s cost them 3 x 5, and they get a total payoff of 35. How about if they deviate? If they deviate that means they don’t get MBA’s. So they’re not MBA’s. They’re identified as what? If they don’t get an MBA, what are they identified as? What does the employer think the non-MBA’s are? Bad. So if they deviate then the employers think they’re bad. Even if they dance on the table and say they’re good, they’re in fact bad–they’re identified as bad. And so their payoff is what? What are they going to get paid? They’re going to get paid 30. And sure enough 35 is bigger than 30, so they’re not going to want to deviate. So that’s good news. What about the bad workers? Let’s check them. So the bad workers, in equilibrium, they’re not MBA’s. They don’t get an MBA. They’re identified as bad. And they’re paid what? What are they paid these bad workers? Somebody? They’re paid 30. They’re paid their productivity. So their payoff is just 30. They didn’t get an education so it was free. They get 30 for free, so their payoff is just 30. If they deviate, if the bad workers deviate, then they get an MBA. So here come the bad workers. They find their way into my class in SOM. They have a miserable time. (I have a miserable time because they’re having a miserable time.) But at the end of the day they’re identified as good workers and hence they’re paid 50. And their payoff is 50 - 3 x 10.01 which is approximately 20. Is that right? So they don’t want to deviate either and now I’m done, I’ve shown it’s an equilibrium. So just to recap. To show that this was an equilibrium, I had to show that the good workers happily self select into education and don’t want to deviate and skip business school. I have to show that the bad workers self select into not getting an education and don’t want to deviate and become MBA’s. And I have to show that the employers infer from this what they should infer from this, which was fine. So I’m done. This is indeed an equilibrium. So notice, in this equilibrium, the good workers do manage to distinguish themselves from the bad workers, and they do end up getting paid more (albeit at the cost that they’re going to die a year later). So this is called a separating equilibrium–which I can never spell. I’m probably spelling this wrong. It’s a separating equilibrium. Why is it called a separating equilibrium? It’s called a separating equilibrium because the types manage to separate and get identified. That’s slightly misleading. The good types manage to separate and get identified, and the bad types, they don’t want to get separated, but they do get separated. Now, how many of you have seen some version of the Spence model before? Some of you, let’s go into this in a little bit more detail to see if we’ve really understood it. So in particular could we get away with a shorter degree? Here we had people going to get MBA’s and it took them three years each. That seems an awful long time to get an MBA. So how about a one year MBA. Some of you might think this is a somewhat abstract example but actually this is the kind of thing you hear about all the time. If you listen to ads in the education press you keep on hearing schools, perhaps schools who lack Economics professors, putting up the proposals for one year MBA degrees. I won’t mention any schools by name because I’ll probably get in trouble. So how about a one year MBA? Let’s see if that will work. And we’ll allow good workers to separate themselves from bad workers. Let’s assume that the costs per year are the same as they were before. And let’s suppose that this candidate equilibrium, this putative equilibrium, involves the good workers getting the MBA’s; the bad workers not getting an MBA; and the employers, just as before, identifying MBA’s as good and non-MBA’s as bad. Question: is that an equilibrium? So who thinks yes? Who thinks no? So you can all tell my why then. So the answer is no. So why is that not an equilibrium? Somebody, anybody? Someone who hasn’t answered yet. Your name is? Professor Ben Polak: Asman, so shout out. Student: The bad workers would also benefit from doing the MBA because their payoff is still greater. Professor Ben Polak: Good, so what’s wrong in this equilibrium, it’s not the employer’s beliefs. If in fact people did follow this behavior then employers would be right to identify MBA’s with good. It’s also not the good workers problem. If in fact, employers are going to pay more to MBA’s, then the good workers are even more so going to want to go ahead and get MBA’s. The problem here–this is not an equilibrium–and the problem is the bad workers. The bad workers’ incentives are wrong here. Why? Because if the bad workers do what they’re supposed to do in this equilibrium–actually it isn’t an equilibrium, but in this supposed equilibrium–what they’re supposed to do is not get an MBA and get a payoff of 30. But if they went and got an MBA, if they deviate and no one else deviates, just them deviating, if they deviate they get an MBA. According to the equilibrium, they’re now identified as good workers. They’re identified as good so their payoff would be 50 minus one year at approximately 10 for a total payoff of 40. But 40 is higher than 30 so that’s violated our equilibrium condition. Everyone see that? So here the bad workers, if it only took one year of pain and suffering to get an MBA, the bad workers would go and get an MBA as well. And that would be trouble because now everyone gets an MBA and its just like dancing on the table again. So how long must an MBA be? In this model, with this cost structure, how many years must it take to get an MBA? Two years, right? One year didn’t work but you can try at home and check that a two year MBA will work. Two years will be just enough to put off the bad workers. Leaving aside the numbers though, what’s the idea here? The idea is that to work as a successful signal, the signal has to separate the good workers from the bad workers. The workers have to choose to be separated. They have to self select into being MBA’s or not being MBA’s, and we need just enough pain and suffering–and let’s be careful–just enough difference in pain and suffering for the workers to select correctly. So what we need, we need enough difference in cost for good workers to get the degree and for bad workers not to want to do so. So one thing we could do is have a two year degree. If you absolutely insisted on having a one year degree, how could you create a difference in cost that would work? Suppose you were employed to advise some university out in the west somewhere, who wanted to have a one year degree program. What should you do in that one year degree program to make it work, to make it allow people to separate? Raising tuition isn’t going to work because that’s the same for good and bad workers. You need a way to separate the good and bad workers. How are you going to do it? You’re going to make it really hard. If you want to have one year degree program, it’s got to be really hard. You’ve got to really jack up the difference between the good and the bad workers, so you need to hire professors who have really bad handwriting. Let’s try and take a step back from this model and see what we’ve learned here. Let’s just try and draw some lessons off this. I want to draw two kinds of lessons. I want to draw lessons in general about what makes a successful signal in society, and then I want to draw lessons about education. So I want to start with some nerdy lessons about Game Theory if you like, and then I want to want to talk about some more specific lessons about the education system. So the key lesson here is the lesson we just learned. The key lesson is: to be a successful signal, to be able to separate types of people, you need there to be large differences in costs. So the first lesson is a good signal–it isn’t that it has to be costly–it has to be differentially costly across types. The reason is you want the types to self select, so there better be differences in costs. Be a little bit careful here: you could have differences in benefits but we’ll leave it as cost for now. That’s one lesson. Now what’s that telling us in this model? That’s telling us that if you make it very, very easy to obtain qualifications in the U.S. society, for example, if you lower the standards that you need to get a high school degree and perhaps you lower the standards to get a college degree–I’m not saying that is happening, I don’t want to take a political position on this. In England that’s happening. I can do that. In England that seems to be happening. So you lower the standards it takes to get a high school certificate in England, and then you perhaps lower the standards to get a college degree, what are you going to see happen? You’re going to see qualification inflation. If you make it easy for everybody to get the first degree, the good workers are going to go on and have to get a second degree. If you make it easy to get the second degree, they’re going to go on and get the third degree. So what this model predicts is if you get rid of this cost difference then workers will find a new way to raise the cost difference again. The way that takes place, at least in some economies, is you start seeing qualification inflation. By qualification inflation I mean that, pretty soon, even to drive a dump truck you need to have a university degree. Okay, now what are the lessons here for education more generally? This is a pretty sparse model of education but all of you, and more immediately me, are involved in the education system. So we should care about it a bit. It’s probably the most famous model of education. As I say, it won somebody the Nobel Prize. What is it telling us about education? So the first thing I claim, I claim that this is a rather pessimistic model of education. Why is this a pessimistic model of education? What’s pessimistic about this model? Let’s talk about that a bit. Anybody, some hands up? Some different hands? Why is this a pessimistic model of education? Way over there, a hand in another part of the room, that will give the camera a work out anyway. Student: You won’t learn anything as a rule, as that school has absolutely no value for education. Professor Ben Polak: Good, so shout it into the microphone, but that was right. Student: You don’t learn anything at school in this model. Professor Ben Polak: Right, this is a model with no learning. There’s no learning in this model. In fact, people in this model go in with their productivities at 50 and 30 and they come out with their productivities at 50 and 30. Nothing you do at school enriches you or makes you more productive. That’s a pretty pessimistic lesson. Here we are in Lecture #23 or something. And the message of this model is, you guys haven’t learned anything: you’ve just had a lot of pain and suffering. So there’s no learning in this model. Now I hope that’s not true as a model of education. I hope it’s not true that we only have pain, but nevertheless, let’s pretend it’s true at least for now and see where it takes us. So a second observation of this model, if we believe this model of education in which you don’t learn anything, education is just being used by those people who are good anyway to separate from those people who were bad anyway, then education in this model is socially wasteful. Why is education socially wasteful in this model? In what sense is it socially wasteful? Think of it from the point of view of an economist? In this model, the productivity of the workers doesn’t change because of education, but some resources were used by the good workers to get an education. At the end of the day, the good workers are better off. The bad workers are worse off and employers are the same as they would have been otherwise, but that’s just redistribution. There’s no product from education but resources were wasted in education. Does that make sense? So in particular, in our two year equilibrium, or in our three equilibrium, it was the good workers who went to college, or in this case went to business school and they wasted three years at five a piece. So there’s a waste of 15–a waste of 10 in the two year model. According to this model, education is socially wasteful. How do we actually visualize that waste in society? So let’s take the model seriously, where is that waste manifested in society? Where is that waste manifested? So you guys aren’t working, and where else is it manifested? You guys sitting here is part of the waste. You should be out doing something else, and where else is the waste? Me. You should take all your Yale professors, stop using them as Yale professors and wasting those resources, and have us go out and till the fields or drive taxis or something. So there’s a social waste here and what we should do is, according to this model, is we should send the professors to drive taxis or dump trucks I guess. I’m not claiming we’d be good at driving dump trucks. Our comparative advantage is certainly in teaching classes rather than driving dump trucks. But it turns out that, in this model, teaching classes is completely a waste of time, and therefore you’re better off using those resources to drive dump trucks. Third, notice that in this model the result of education is what? It’s good for the good workers, you guys managed to separate yourselves and get paid high wages. That’s nice for the Yale graduates here, but who were the losers in this model? Who were the losers? The bad workers, the 90% of workers in this economy who aren’t naturally gifted, who aren’t going to find education easy. They, in this model, end up being paid 30., Without the education system how much would they have been paid? 32. So in this model education increases inequality, and it doesn’t increase inequality in a benign way just by making the rich richer. It increases inequality by making the poor poorer. Education, in this model increases inequality. In this model it actually hurts the poor. Now, that strikes me as a pretty important lesson actually. Again, I don’t think we should take this model too literally. In the real world, I at least hope that some of you are learning something at Yale. You’re looking extremely doubtful that you could possibly learn anything at Yale, so maybe you’re not, I don’t know. But, in the real world, I’d like to believe people are learning here at Yale. But one of the things that’s going on in education in addition to learning, one of the things is that you guys are separating yourselves and signaling to employers that you’re going to be good workers for them. As a consequence, that’s great for you but someone else is being paid less. This strikes me as an important lesson to hear in an election year. In every election year in America–I’ve been in a few election years in America now–there are two things that all politicians agree on, whether they’re far right or far left. All politicians agree on two things. They agree that two things are good. One: kissing babies. Two: they all want to be “the education President,” is that right? All of them, is that right? Now, as a parent of some babies, I’m not sure I want to have politicians’ kissing babies but that’s for another day. The point here is what we’re learning–don’t go yet guys–what we’re learning here is that if education hurts the poor maybe we shouldn’t be so keen to decide that we should subsidize the education sector itself. Although, as an educator, I hope you don’t tell that to anybody. What’s the take away message of this model then? The take away message is for education to work as a signaling device, for education to generate a separating equilibrium, some children have to be left behind. We’ll talk about that more on Wednesday.